Projected growth in the construction market especially of high rise building along with upcoming new hotels & shopping malls and increasing inflow of FDI in the construction and retail sectors would proliferate the overall growth of elevators and escalators in Saudi Arabia. In Saudi Arabia, elevator segment captured major share in the overall elevators & escalators market, wherein majority of the installations were witnessed in residential, retail, transportation and hospitality sectors. However, escalator segment is projected to grow at a higher CAGR during 2018-24, primarily due to growing installations across airports, metros, and railway development projects in Saudi Arabia. In Saudi Arabia, the Central region held majority of the Saudi Arabia elevators and escalators market share, in terms of volume owing to increasing infrastructure development activities, especially in the commercial and residential verticals. During the forecast period, western region is expected to register higher growth in the market. 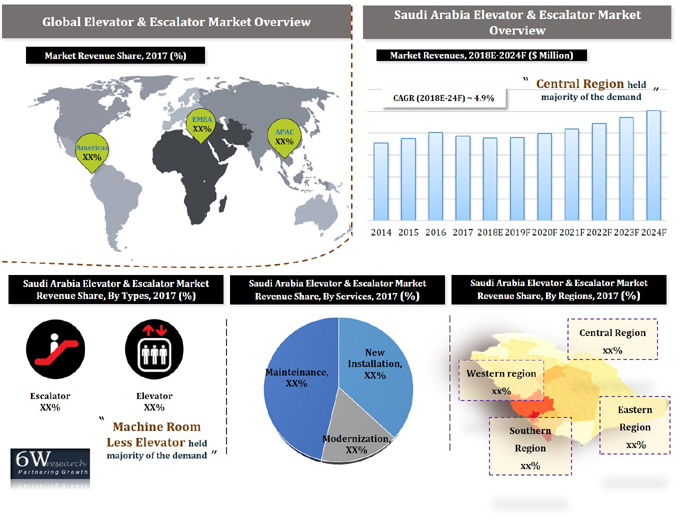 Saudi Arabia elevators and escalators market report thoroughly covers the market by elevators and escalators types, sub-segments, verticals, and regions. Saudi Arabia elevators and escalators market outlook report provides an unbiased and detailed analysis of the Saudi Arabia elevators and escalators market trends, opportunities/ high growth areas and market drivers which would help the stakeholders to device and align their market strategies according to the current and future market dynamics. 15.1 Mitsubishi Electric Saudi Ltd.
15.4 Otis Elevator Co. Saudi Arabia Ltd.
15.5 Schindler Olayan Elevator Co. Ltd.